Here's a card I made for the Limelight Papercrafts sketch and product challenge. The product challenge right now is chipboard. I love me some chipboard! Originally, this card was for Noah (a little boy celebrating his last Christmas) however the family celebrated on Nov 8 and have asked that no more cards and gifts be sent. Noah is very sick and they just need peace right now. So, I will keep this card and just pray for Noah and his family. Ok, this card uses Jolly by Golly from Cosmo Cricket, both the DP and the chipboard. The sentiment is from the OLD Unity Birds of a Feather kit. I don't think the new kit has words in it. And it was just that easy peasy. I wanted something I could send right away and not a lot of embellies that I child could choke on. oh, I love this Ashley! great minds think alike! isn't that snowman just the cutest! great work with the sketch. Super cute! Makes me want to run out and get this line! :) Hope you have a nice, relaxing weekend! cute! I love that snowman! 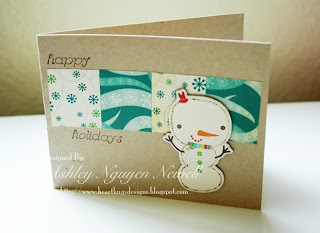 Ashley, I love that snowman, Super cute! I love it! Such a sweet card! That snowman is adorable!